I usually find something to bring home when I go to Illums Bolighus (not to be confused with Illums a few paces away). Who am I kidding, it's always a struggle to just buy a couple of things! One of my favourite producers of kitchen gadgets and other desirable objet is Eva Solo. Simple design, functional (although I'll forgive the first version of the garlic press) and just lovely to use and have hanging about on a kitchen bench. Strolling around Illums Bolighus I spied a gorgeous new white cooking set from Eva Solo called the White Line. And it was on sale! The smallish casserole and the saute pan caught my eye. I was thinking soups, risotto, stews...that sort of thing. Sure I already have enough pots and pans, but these ones just looked so good I had to have them. I'm a bit impulsive like that. Much more shopping and eating followed (I still have to tell you about Geist, Michelin-starred a|o|c and several cakes from Conditori La Glace) but I couldn't wait to get back to London and cook in my new casserole. With the white pan, I just knew I had to make something that contrasted sharply with it. It was cold out, so a hot soup was top of my list of options. 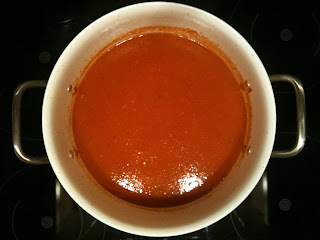 I finally settled on a Tessa Kiros red pepper soup. I love Tessa. I feel like I can call her Tessa because I've cooked so many meals from her books. I've shared her recipes and gifted her cookbooks. One friend in the USA makes the lamb stew with green beans and feta (from Apples for Jam) all the time after I told her how great it was. We made it again a few weeks back too, and it is one of my favourite things to eat. 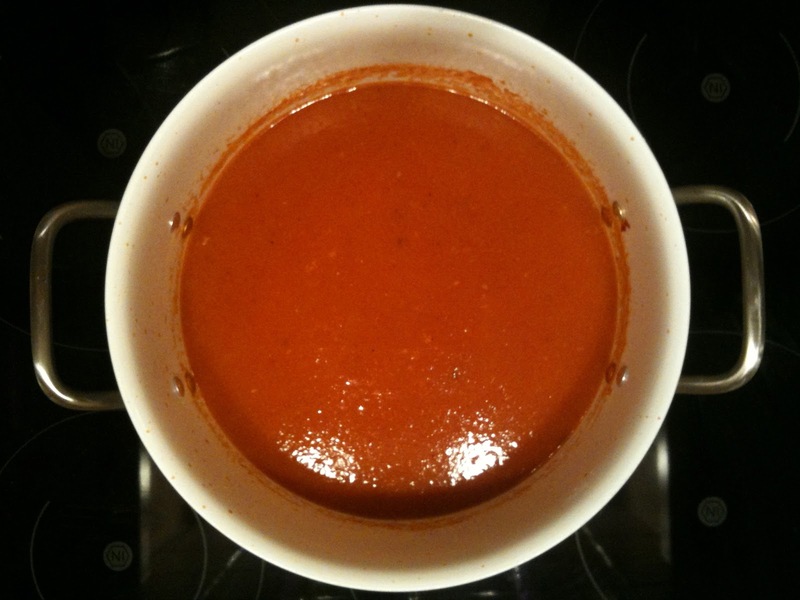 The red pepper soup is from the Falling Cloudberries book. It's pretty straightforward. You just add grilled peppers to some sautéed garlic and red onion along with chopped tomatoes. Throw in a few cups of water and simmer, covered, for half an hour or so, then blitz et voila! Serve with some chopped olives (I used salted Greek olives and went easy on the seasoning), some grated lemon zest for zing, a little finely chopped rosemary for some depth and some thinned Greek yoghurt. A few drops of extra virgin olive oil completes the dish. Simple but effective and very tasty indeed. And I think it looked great in my new pot. By the way, the bowls I served the soup in were bought in Copenhagen too! If you haven't tried any recipes from Tessa, I suggest you give her a go. The carrot cake is also the best. Really, THE BEST! Actually, all this talk of Copenhagen reminds me that I should tell you about my noma meal before it was the super famous pilgrimage joint it is today. My lack of tipping haunts me to this day! Hi! I really like the look of the pots too! Did they retain their whiteness after cooking and washing? Thanks! They're great! I even cooked a thai red curry in one and no problem with staining. Highly recommended!